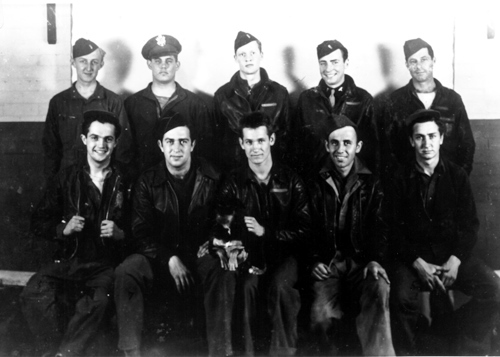 One of the most famous members of the 384th Bomb Group was part of the original group, but flew in a B-17 only once. He walked on four legs and his name was Delbert McNasty. 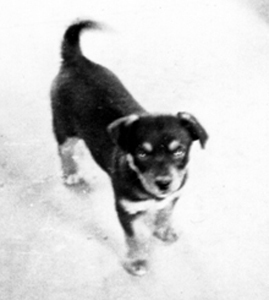 While the group was still stateside, bombardier Robert J. Kennedy and his wife Gloria saw the pup in a pet shop window in Salt Lake City and ponied up the hefty sum of ten dollars to take Delbert home. In May 1943, Kennedy and the rest of the Jesse D. Hausenfluck, Jr. crew of the 544th Bomb Squadron smuggled him aboard their B-17 on the Atlantic crossing to their new base in Grafton Underwood, England. The flight was twelve hours long and when they reached 10,000 feet in altitude, the crew and Delbert required the use of oxygen. Since a puppy oxygen mask was not standard equipment on a B-17, Delbert was placed in a duffel bag fitted with an oxygen hose. Delbert did not appreciate the confinement of the bag, however, and kept escaping. He was caught and returned to the bag over and over again. Delbert was later known for his peculiar behavior which was blamed on possible brain damage due to lack of oxygen during that flight. Delbert’s flight to Grafton Underwood was his last. At the base in Grafton Underwood, Delbert spent time in the officers’ quarters and the enlisted men’s quarters and racked up offenses in both. He started relieving himself in shoes. At his “court martial” he calmly listened to the charges against him before repeating the offense. Delbert also had the habit of raiding the mess hall. Shooing him out once again, the mess officer became so exasperated he threatened to kill Delbert if he returned. The Hausenfluck crew’s co-pilot, Donald MacKenzie, stormed into the mess hall, gun in hand, and swore to kill the mess officer if any harm came to Delbert. As the days and weeks of combat wore on, more and more of the original crews of the 544th Bomb Squadron did not return from their missions. The Hausenfluck crew did not return from the August 17, 1943 mission to the ball bearings factory in Schweinfurt. Hausenfluck and MacKenzie were killed. The remaining crew, including Kennedy, were taken prisoner. Allegedly, Delbert was adopted by a Red Cross Girl and left the 384th Bomb Group base at Grafton Underwood, never to be seen there again. Story courtesy of James Traylor, ball turret gunner with the Hausenfluck crew, and 384thbombgroup.com. By thearrowheadclub in 544th Bombardment Squadron (Heavy) on March 22, 2017 .